Put away the straight pins! Plant 'Voodoo' for its bold foliage color of mahogany-red and contrasting rosy-red flowers in summer. 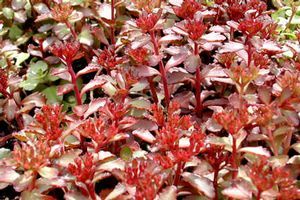 The spreading succulent foliage rises to 4-6" and will fill in quickly as a ground cover or along a stone path. Drought tolerant and very showy all season long.